Home > Birthday Gift Baskets > CELEBRATION CAKE! 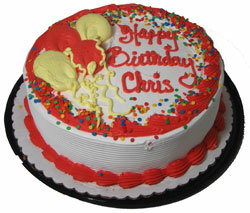 We've partnered with a local bakery to offer great tasting cake for local hand delivery! 10" two-layered round cake (serves 12-16 people). Icing is butter cream. We wrap in cellophane and top off with a handmade bow. Includes a handwritten greeting card. ordering before noon on Friday. about the cake and icing choices and no message on the cake. Local Dallas Hand Delivery Only. Once you've chosen your cake and icing, please tell us in Special Instructions during check out, the short message you would like on the cake (Example: Happy Birthday Jeremy) and icing decoration color.